As expected, the European Council has ended without taking a decision on the most painful issues from the agenda: reducing Greek debt and enhancing the euro area rescue fund. Even regarding the recapitalisation of banks, on which it was expected a decision to be taken today, the leaders will decide on Wednesday. 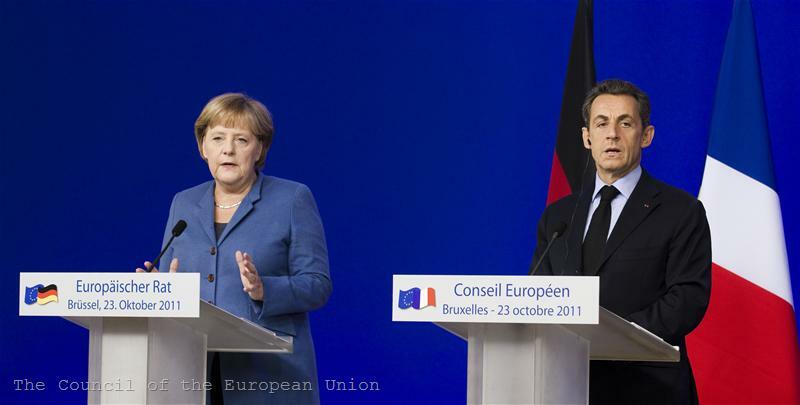 German Chancellor Angela Merkel and French President Nicolas Sarkozy, who unusually for a European Council gave a joint news conference, have announced that the leaders had put a deadline till Wednesday an agreement to be achieved no matter what. "There is a clear determination that by Wednesday we reach an agreement to calm down the financial crisis", the French head of state underlined. On her part, Chancellor Angela Merkel added that on Wednesday there would be a meeting of the leaders of all the 27 member states, which then will transform into a summit of the 17 from the euro area, which, according to Mrs Merkel, would continue longer and the leaders outside the eurozone would be briefed in due time. 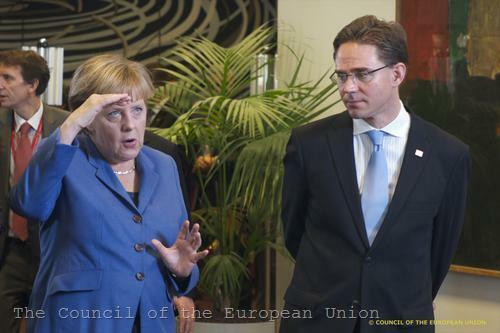 "But", she emphasised, "these have to be decisions of the euro area countries". Regarding the enhancement of the rescue fund EFSF Angela Merkel said only that the finance ministers discussed yesterday two different models but that both did not include the European Central Bank, "because the Treaty simply does not allow that". Nicolas Sarkozy added that the ECB was independent and that France was attached to its independence just like Germany. 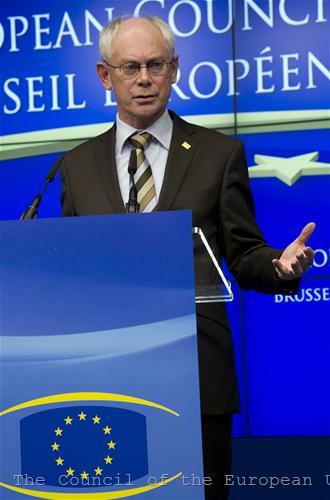 He stressed that there was no viable solution unless there was the support of all the European institutions. And if there are any pieces of news from today they can be called organisational. "I am fully aware of all the sensitivities of the relationship between the 27 and the 17 member states", European Council President Herman Van Rompuy defended his decision to call again a European Council, aside from the eurozone summit. And not only on Wednesday but always before the euro area leaders meetings there will be a meeting of the European Council. In the Council conclusions it is explicitly written that "The European Council agreed on the need for coherence of the activities of the Euro area and the European Union", but "the European Commission has the responsibility to ensure compliance by all 27 Member States with EU legislation, including that relating to the internal market, and to safeguard a level playing field among all Member States including those not participating in the euro". For unity called earlier today European Parliament President Jerzy Buzek. 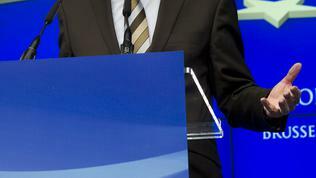 Until the election of a permanent eurozone summits president this function will be performed by Herman Van Rompuy. In order to tighten fiscal discipline and deepen the economic union a possibility will be studied for limited treaty changes. Although the purpose is to create a eurozone government, a possible treaty change has to be approved by the 27 member states. 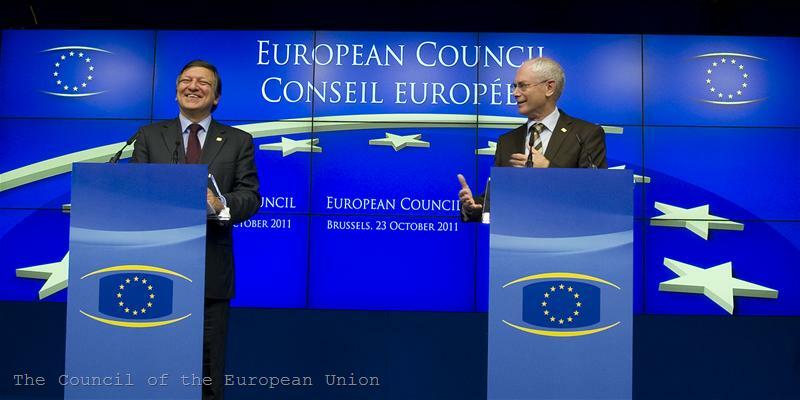 The European Council will get back to this matter in December on the basis of Herman Van Rompuy's report. 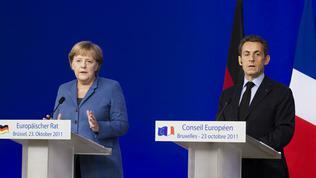 For treaty changes also spoke Sarkozy and Merkel, mentioning only that "treaty changes are not excluded". Obviously the offensive of some member states like Poland, for instance, not to allow the division of Europe into two speeds, has borne fruit. According to Council sources there was British pressure for a European Council meeting on Wednesday. Although it is not a member of the euro area, Britain is actively participating in the debates on solving the crisis with the clear knowledge that this is of vital importance for its own stability. Britain has repeatedly stated that almost half of its exports are to the eurozone and this is why it is so active in discussing a solution to the crisis. However, the same cannot be said about Bulgaria whose exports are also to a large extent to the eurozone. Yesterday the EU finance ministers deliberated for 10 hours but euinside learnt that the Bulgarian finance minister left in the early afternoon. Today Prime Minister Boyko Borissov also left early, around 13.00 CET, arguing that there were elections in Bulgaria, given that the discussions on EU-27 level continued until 16.30. This is why the Bulgarian journalists were unable to get any information from the prime minister on the developments of the debates on the controversial issues. 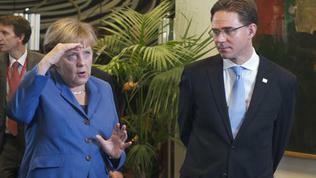 The premier only said that Bulgaria supported the German position. Against the backdrop of Greece's problems and the growing pressure of the financial markets, Italy continues to be under the spotlight. 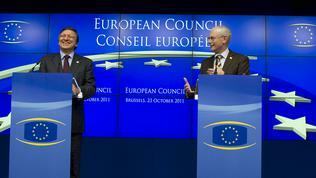 European Council President Herman Van Rompuy said that he and the Commission were in constant contact with Italian Prime Minister Silvio Berlusconi and expected to receive his guarantees that the adopted fiscal and economic measures would be applied effectively, as well as the reforms of the labour market, the public enterprises, the judiciary, the fight with financial fraud. Investors and the other countries from the eurozone have to make sure that Italy will deliver on its commitments, Herman Van Rompuy said and called on Italy to make "a huge effort". 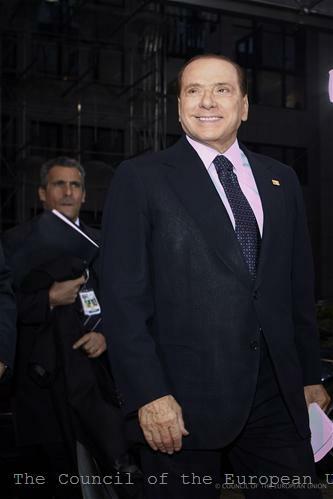 About trust in Mr Berlusconi's capability to deliver were a large part of the questions to the Merkel-Sarkozy tandem, who reiterated the need for solidarity with all in the eurozone. On Wednesday there will be a meeting of the EU finance ministers who will finalise the work on the so called comprehensive plan to tackle the crisis. Then there will be a European Council and a eurozone summit where it is expected the leaders to take the long awaited bold and decisive decisions.